Send your partner 5 bags of tea. Decorate each tea bag with festive wrapping of some sort and the number for the day. 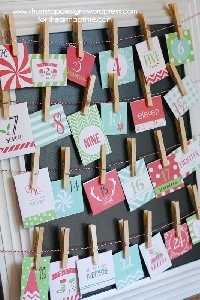 This swap is for the last set of 5 of the calendar so label the bags 21,22,23,24,and 25. It sounds like each little bag will have a tea for morning and a tea for night so 10 right? No just one tea one a day. I was just story telling a bit meaning you can use this as your morning tea OR your tea before bed. Basically whenever you drink your tea usually.